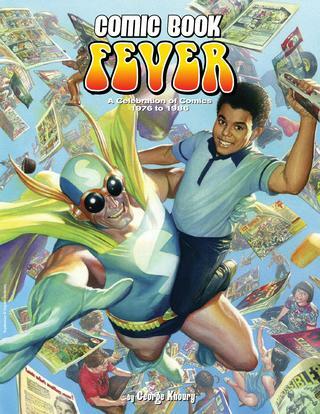 Starting today, we’re exposing fans to Comic Book Fever, our infectious new book celebrating comics from the magical era of 1976-1986, when all different genres were available to any kid with a pocketful of coins, at establishments from 7-Elevens to their local drug store. George Khoury (author of The Extraordinary Works of Alan Moore, Kimota: The Miracleman Companion, and Image Comics: The Road to Independence) spent years penning this exhaustive tribute to his personal golden age of comics, covering all the things that made those comics great—the top artists, the coolest stories, and even the best ads. Inside this 240-page full-color trade paperback ($34.95 cover price) are new articles, interviews, and images about the people, places, characters, titles, moments, and good times that inspired and thrilled fans in the Bronze Age: Neal Adams, John Romita, George Pérez, Marv Wolfman, Alan Moore, Denny O’Neil, Jim Starlin, José Luis García-López, The Hernandez Brothers, The Buscema Brothers, Stan Lee, Jack Davis, Jack Kirby, Kevin Eastman, Chris Claremont, Gerry Conway, Frank Miller and others. Reviewer Dan Greenfield declares this book to be “the Bible of the post-Baby Boom”! Kevin Eastman (co-creator of Teenage Mutant Ninja Turtles) can’t wait for it. Captain Strangelife even does a YouTube video review! With cover art and Introduction by superstar painter Alex Ross (featuring Snyderman from those unforgettable 1970s mail order ads), Comic Book Fever sends readers on a contagious trip back in time to re-experience those epic stories, and feel the heat of that era once again. It’s currently spreading through comics shops worldwide: order using Diamond Comic Distributor’s code #MAR161774. You can see a free preview and order at TwoMorrows Publishing’s website through THIS LINK! This entry was posted in TNT on 23 August 2016 by Mr. Morrow.